Those prefolds in the large white package shrunk down to about half that size. So, waaay back in August of last year, I decided that I wanted to cloth diaper with Bo. Mostly, it was because I liked the idea of reusing diapers rather than throwing them away, and I really hated our old Diaper Genie. I was also hoping that maybe Bo would have fewer rashes in them. I also think they are cute! Now that we have used them for several weeks, I have found a few things out. 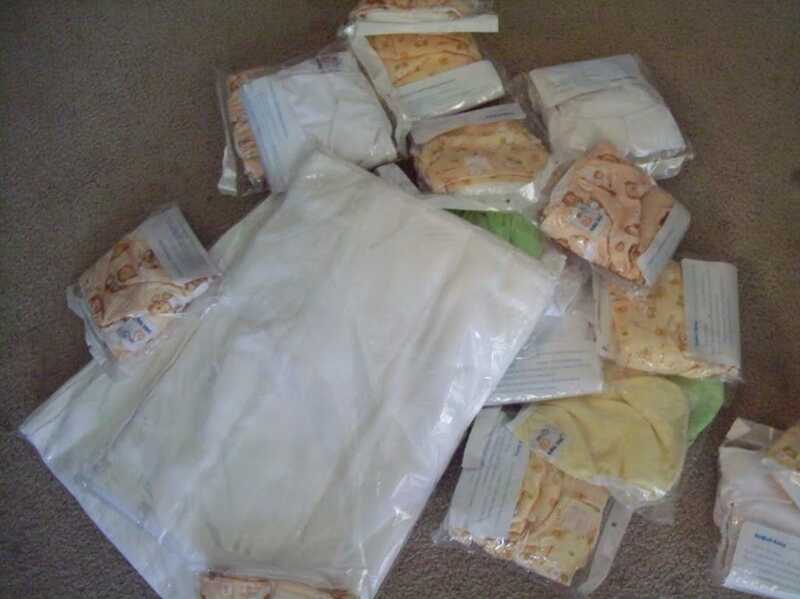 If you are thinking of using cloth diapers, you might want to know some of this information too! I have a collection of pocket diapers and prefolds with covers. While I love the idea of the pockets, they have actually been much more of a pain to deal with. First, they are extremely persnickety about fit. If there is any loose area at all, they will leak. Second, they cannot withstand any kind of diaper rash cream at all. We tried regular drugstore cream with Bo when she had her first rash (my babies tend to get rashes easily. Monkey used to get them so bad that they bled) and that practically destroyed the pocket diapers. Even the “cloth diaper safe” rash cream has blocked their absorbency. Stuffing the pockets is also a pain during laundry time, but it does make changes faster. So far, my favorite diapers to use at home are the prefolds and covers, and my favorite on-the-go diapers are the pockets. I have four Flip covers that I absolutely love. I have 4 or so Kawaii Baby covers that I am less pleased with. The elastic already seems like it is wearing out. I love the prefolds because it is so simple to fold the diaper into thirds like a pocket insert and lay it in the cover. You don’t have to use a new cover every time, which I really like. The cotton prefolds are also way less sensitive than the pockets. I used the regular diaper cream with them and continue to use the cloth diaper safe cream without any issues whatsoever. I also have Kawaii Baby newborn pockets that I loved, until I ruined them with the diaper cream. But once they are working again, I expect to love them again. I also have three MG Baby pockets that are amazing, and I recently purchased some Alva pockets. So far, I have been less pleased with them, but I have yet to really experiment with them. I also have two wool covers that I use at night with a prefold. I love them. They are soft and cuddly, and smell like lambs to me. They are amazing at preventing leaks. We also use flannel cloth wipes, because why use disposable wipes when you already wash the diapers? So there you have it. Do you cloth diaper? What are your favorites?